Non-Beach Waikiki Hotels: Deals & Details at the Entry to Waikiki. Northwest Waikiki Hotels for Your Hawaii Vacation! 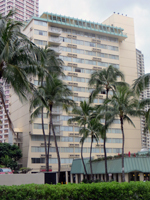 This page is specifically about the Waikiki hotels that are located in the northwest portion of Waikiki, but not directly on the beach. These hotels are closest to Ala Moana Shopping Center, the Hawaii Convention Center, and downtown Honolulu. Some have direct views of the weekly Waikiki fireworks, and many have easy access to the beaches at the Hilton Lagoon, Magic Island, and Ala Moana Beach Park. Click one these links if you want to see my reviews of the Waikiki Beach resorts and/or non-beach hotels in central and southeast Waikiki. Check Rates and Availability at Hotels.com (ad). Hawaii Vacations: Save 30% or more in paradise! : search keyword "Prince Waikiki". 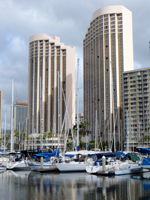 The Hawaii Prince Hotel is definitely located oceanfront – though not technically beachfront – on the edge of the Ala Wai Boat Harbor (where you should never consider swimming). As a result, it has a great ocean view out over the marina and an equally good view of the Waikiki fireworks every Tuesday and Friday night. It’s the first hotel you’ll come to when entering Waikiki along the coastline. 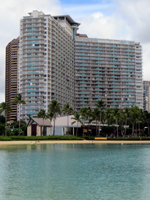 And if you want to go to the beach, it’s just a short walk through the marina and out past the Hilton lagoon or across the canal to Magic Island and Ala Moana Beach Park. This hotel is a short walk away from the Ala Moana Shopping Center. It’s also a very nice property; and although I can’t call it a cheap Waikiki hotel, the rates* I found (above) make this hotel a Hawaii vacation deal in terms of value for your money. This hotel is ideal for dream vacationers, family vacationers, and bargain hunters with a moderate budget. Check Rates and Availability at Hotels.com (ad). Hawaii Vacations: Save 30% or more in paradise! : search keyword "Modern Honolulu". 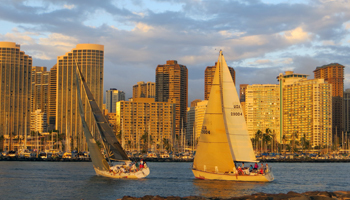 The Modern Honolulu is also located oceanfront – but not beachfront – on the edge of the Ala Wai Boat Harbor. It too has great a great ocean view out over the marina. I can’t tell if it has an unobstructed view of the weekly fireworks shows, but they’re a very short walk if not. To get to the beach, it’s just a short walk through the marina and out past the Hilton lagoon. This property bills itself as a cosmopolitan lifestyle hotel. In my mind, that translates to ritzy and expensive. Nevertheless, it’s in a great location just a short walk from the Ala Moana Shopping Center; and from what I’ve seen walking through, it seems to be nice. Be sure to check out the broken surfboard collage behind the front desk. This hotel is suitable for dream vacationers. Check Rates and Availability at Hotels.com (ad). Hawaii Vacations: Save 30% or more in paradise! : search keyword "Ilikai". The Ilikai Hotel is also located oceanfront – but just barely not beachfront – on the edge of the Ala Wai Boat Harbor and Hilton Lagoon. It also has a great ocean view over the marina and an equally good view of the Waikiki fireworks. 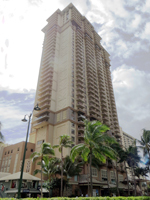 It’s a short walk from Ala Moana Shopping Center and even shorter stroll to Waikiki Beach. I’ve been to this hotel many times for ballroom events and/or entertainment, but I’ve never been a guest. Nevertheless, from what I’ve seen, the guest rooms look large and spacious – and at least some of them have full kitchens. 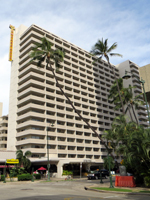 This is one of the older Waikiki hotels; but fortunately, the hotel management was recently taken over by the Aqua Hospitality group. In general, I’ve been impressed with the renovations and improvements done at numerous Aqua properties throughout Waikiki. I expect Ilikai gets the same treatment. This hotel is well suited for dream vacationers and family vacationers. Check Rates and Availability at Hotels.com (ad). Hawaii Vacations: Save 30% or more in paradise! : search keyword "Trump Waikiki". 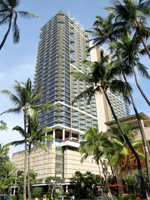 The Trump International Hotel is one of the newest Waikiki hotels. As a result, I haven’t yet had any occasion to go there – but it looks like it’s very nice. It seems to be very modern and classy. But would you really expect any less from Trump? With only one other property separating it from Waikiki Beach, your access to the sand is just about as easy as any of the Waikiki Beach hotels; and you get a great ocean view from the upper floors. You also get a great view out over Fort DeRussy Park; and as far as I know, you can see the weekly Waikiki fireworks shows. This hotel is suitable for dream vacationers and some family vacationers. 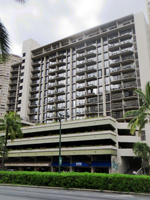 The Grand Waikikian Suites by Hilton Grand Vacations is located adjacent to the Hilton Hawaiian Village, which means it’s very near the beach. Just a quick stroll past the Hilton Lagoon and you’re on the sands of Waikiki. This too is one of the newest Waikiki hotels; and it also seems to be very modern and classy. Basically it’s everything you expect from Hilton. Of particular interest to some families: all or most of the guest rooms are suites. This hotel is suitable for dream vacationers and some family vacationers. Check Rates and Availability at Hotels.com (ad). Hawaii Vacations: Save 30% or more in paradise! 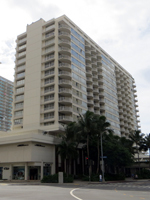 : search keyword "Marina Tower Waikiki". 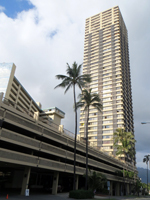 The Marina Tower Waikiki is located just a short walk from Ala Moana Shopping Center and the Hawaii Convention Center. It’s a little trickier to get to the nearest beaches near the Hilton Lagoon and Magic Island because the property is located on the mauka (toward the mountain) side of busy Ala Moana Blvd. Nevertheless, the hotel is tall enough that there are some great views in all directions from the upper floors. This property is an extended-stay hotel with rooms that seem to be fairly small and odd-shaped (as you might guess by the unusual size and shape of the tower itself). Nevertheless, it should be more than adequate for guests who just need a place to sleep. And as far as I know, all or most of the rooms have kitchenettes; so you can save money on meals as well. This hotel is well suited to bargain hunters. Check Rates and Availability (ad): Always book at Ramada.com for the guaranteed lowest rates! Search destination "Waikiki". 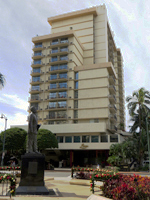 Even though the Ramada Plaza Waikiki is located just across the street from the Hilton Hawaiian Village, you have to walk approximately 1 km (0.6 mile) to the nearest stretch of Waikiki Beach, and it’s almost exactly the same distance to Ala Moana Shopping Center and the beaches at Magic Island/Ala Moana Beach Park. Nevertheless, the value price could easily outweigh convenience for anybody who’s willing to get a little exercise. This hotel is also in a convenient location for nearby restaurants and shopping. Basically, I’d say it’s well suited to bargain hunters and family vacationers on a modest budget. Check Rates and Availability at Hotels.com (ad). Hawaii Vacations: Save 30% or more in paradise! : search keyword "Hawaiian Monarch". 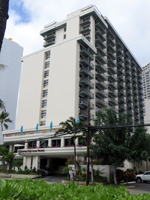 Located near the Kalakaua Avenue and McCully Street entrances to Waikiki, the Hawaiian Monarch Hotel is probably farthest from the beach of all Waikiki hotels. By foot, it’s more than 1 km (0.7 mile) in a more-or-less straight line to the stretch of sand in front of the Hilton Hawaiian Village. It is, however, just a 0.5 km walk away from the Hawaii Convention Center. As would probably be expected from any budget hotel, the guest rooms seem to be fairly small and without many frills. Thus, this hotel is probably best suited to bargain hunters. Check Rates and Availability at Hotels.com (ad). Hawaii Vacations: Save 30% or more in paradise! : search keyword "Waikiki Gateway". The pyramid-shaped Waikiki Gateway Hotel has been renovated somewhat recently – giving it a fairly modern look and feel. It has a great view of Fort DeRussy Park and more-or-less direct access to the beach across the full length of the park (approximately 0.6 km). As far as I know, some of the rooms also have kitchens, which can help you save money on meals. Basically, I’d say this hotel is well suited for bargain hunters and possibly also for some family vacationers. Check Rates and Availability at Hotels.com (ad). Hawaii Vacations: Save 30% or more in paradise! : search keyword "Maile Sky". 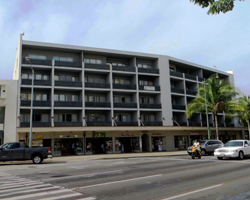 The Maile Sky Court – another property managed by the Aqua Hospitality group – also has a great view of Fort DeRussy Park from the upper floors. 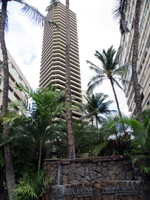 Only one other hotel, a couple of streets, and the length of the park (approximately 0.6 km) lie between this property and the sands of Waikiki Beach. As far as I’ve seen, the rooms seem to be a little small and without many frills; but that’s probably what helps make this hotel a suitable place for bargain hunters. Check Rates and Availability at Hotels.com (ad). Hawaii Vacations: Save 30% or more in paradise! : search keyword "Polynesian Plaza". The Polynesian Plaza is another property managed by the Aqua Hospitality group. From what I’ve seen, I’d have to say it’s not much to look at; and as far as I can tell, its primary view is a busy Waikiki intersection. For that reason, I often wonder if the guest rooms are excessively noisy; but I’ve never been a guest there to be able to tell you one way or the other. The walk to the beach is a little less than 0.5 km; and you can walk along the park, so it’s not unpleasant. I’ve heard that the guest rooms are larger than expected. I’ve also heard that renovations might be ongoing from 2013 to 2014. I assume that’s why I couldn’t get sample rates for most of 2014. But that’s good, because it seems like upgrades were a little overdue. If the improvements are similar to other Aqua properties, this should be a suitable place for bargain hunters. Check Rates and Availability at the Kai Aloha Homepage. 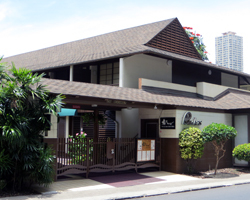 The Kai Aloha Apartment Hotel advertises itself to have a “classic Hawaiian atmosphere”… which basically means that it’s old and hasn’t changed much, if any, in the last 50 years. 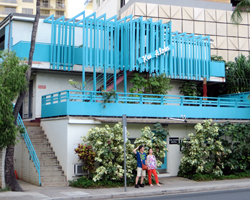 It also appears to be the smallest of all Waikiki hotels. Nevertheless, it’s in a great location only half a block from Waikiki Beach and across the street from the wide open space of Fort DeRussy Park. Furthermore, each room is an apartment complete with kitchen. For that reason, it might appeal to some family vacationers and bargain hunters. However, I suspect that its primary appeal is to anybody wanting to experience the nostalgia of old Hawaii. Check Rates and Availability at Hotels.com (ad). Hawaii Vacations: Save 30% or more in paradise! : search keyword "Equus". The Equus Hotel is a narrow, little, horse-themed boutique hotel surrounded on all sides by larger hotels/apartments. Thus, it’s easily overlooked. But from what I’ve seen of the guest rooms, they seem to be nice (though narrow). More importantly, however, this property is in a good location just 0.5 km from Ala Moana Shopping Center and/or the beaches at Magic Island and Ala Moana Beach Park. But, because it’s on the mauka (toward the mountain) side of the street, you’ll have to walk farther to get to the nearest portion of Waikiki Beach (0.75 km). Though there are definitely some lodging deals to be found here, they appear to be seasonal; so this hotel is probably best suited for family vacationers and bargain hunters who travel at the right time of year. An additional selling point for anybody who’s really into horses… I’ve heard that this hotel has a special arrangement with one of the horseback riding outfits here on Oahu. Check Rates and Availability at Hotels.com (ad). Hawaii Vacations: Save 30% or more in paradise! : search keyword "Aqua Palms". The Aqua Palms Waikiki is another property that almost made my list of discount Waikiki hotels; but the seasonal fluctuation was just slightly too great. Nevertheless, this is still a budget-friendly hotel that may appeal to some bargain hunters. By foot, it’s located approximately 1 km (0.6 mile) from the nearest stretch of Waikiki Beach; and it’s almost exactly the same distance to Ala Moana Shopping Center and the beaches at Magic Island/Ala Moana Beach Park. It’s also conveniently surrounded by several decent restaurants in a variety of price ranges. This hotel is perhaps best suited to family vacationers. In case the Doubletree name and reputation don’t already tell you everything you want to know, I’ll point out that the Alana Waikiki Hotel is a full 1 km walk to the nearest stretch of Waikiki Beach and it’s a 20 percent longer walk to Ala Moana Shopping Center. Nevertheless it has a nice view out over the Hilton Hawaiian Village and part of Fort DeRussy Park. Then, considering the spacious rooms with contemporary furnishings and design, I’d have to say that the sample rates* make the Alana look like a good value for your money. 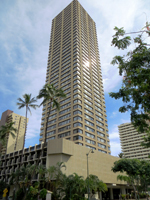 Furthermore, for anybody unlucky enough to be on Oahu for business, this property is just a 0.6 km walk away from the Hawaii Convention Center; and I’ve heard that the rooms have better than average in-room work stations – a rarity in many Waikiki hotels. So in addition to family vacationers and Hilton HHonors program members, I’d say this hotel seems well suited to business travelers. Check Rates and Availability at Hotels.com (ad). Hawaii Vacations: Save 30% or more in paradise! : search keyword "Ambassador Waikiki". The Ambassador almost earned a ranking on my list of cheap Waikiki hotels, but the seasonal price fluctuation was just a bit too significant. Neverthless, there are deals to be found; and the spacious rooms add to the overall value. At least some of the rooms have kitchens and most (if not all) have balconies. The higher floors have a good view out over Fort DeRussy Park. Otherwise, I’d expect few frills. By foot, the Ambassador is located 0.6 km from Waikik Beach. This hotel is suitable for family vacationers and some bargain hunters. Check Rates and Availability at Hotels.com (ad). Hawaii Vacations: Save 30% or more in paradise! : search keyword "Luana Waikiki". The Luana Waikiki was an Outrigger hotel that recently changed management to the Aqua Hospitality group of hotels; so don’t be confused (like I was) if you still see some Outrigger branding around the property. I used to go to this hotel somewhat frequently for entertainment. That was always fun. I expect that quality entertainment will still be a selling point under the new management. 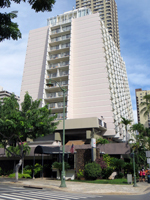 The hotel is located on the edge of Fort DeRussy Park – approximately 0.6 km by foot to Waikiki Beach. It has tastefully tropical décor, and many rooms have kitchens. Good deals are seasonally available, so this hotel could be great for some bargain hunters; and it’s definitely suitable for most family vacationers. Check Rates and Availability at The Breakers Homepage. The Breakers Hotel is small; but it’s in a great location less than a block from Waikiki Beach – nestled between the wide open space of Fort DeRussy Park and the hub of activity in central Waikiki. 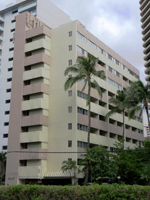 I almost listed this among the cheap Waikiki hotels, but I find myself wondering why such a small property is pricier than many of the bigger/newer alternatives. I suspect you’re paying for the location and homey atmosphere, but I really can’t say for certain. It’s not much to look at, but it could possibly pass for charming. So with that in mind, The Breakers seems best suited for family vacationers who will appreciate the convenient location.